Quarried stone is crushed and transported to a lime kiln. The lime burning process within the kilns requires enough heat to be transferred to the limestone in order to decompose the calcium and magnesium carbonates. ‘Preheating zone’ – limestone is heated to approximately 800°C by direct contact with gases leaving the calcining zone. 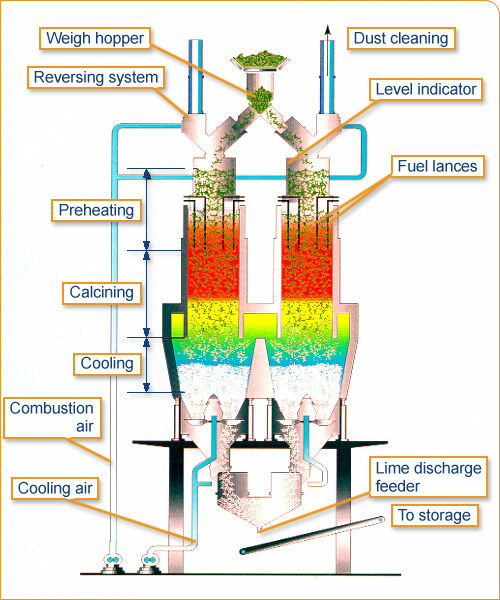 ‘Calcining zone’ – fuel is burnt in preheated air from the cooling zone. This produces heat at above 900°C and turns limestone into quicklime and CO2. ‘Cooling zone’ – quicklime leaving the calcining zone at 900°C is cooled by direct contact with ‘cooling’ air. There are currently three distinct types of kiln operating in the UK, these include; shaft kilns, rotary kilns and twin shaft parallel flow regenerative kilns. Each kiln is selected depending on the nature of the feedstone used and the quality of quicklime required. To make high grade quicklime the ‘Twin Shaft Parallel Flow Regenerative’ kilns (left) are used. Twin shaft parallel flow regenerative kilns have two inter-connected, vertical shafts which are fired in sequence to achieve excellent energy efficiency. The limestone size used by these kilns is usually between 90mm and 125mm. They are on the whole fuelled by natural gas and produce high reactivity and high purity quicklime.